Watching the way that NBC has been handling the Conan vs Leno debacle has me thinking … why do experienced leaders continue to make poor decisions when it comes to succession? Many organizations now have systems in place that help identify emerging leaders – the rock stars of our businesses – and opportunities and challenges are funnelled in their direction. With this comes responsibility, accountability – and hopefully mentoring and support. But all this is a two way street. If we expect accountability from our rising stars, we must also expect it of ourselves. When we are thinking through succession plans – we need to consider not just who’s coming in, but what’s going out. That’s right – when a leader leaves, it marks the end of an era. She will take with her, her whole way of doing business – and the impact of this will be felt right through your business. Perhaps NBC weren’t ready to deal with this type of wholesale change – communicating the way in which this transition would be handled should have been clearer, unambiguous and ongoing. Communications around succession needs to be handled over several months, and in some cases, one to two years. After all, we all crave security. Part of this stability comes from “doing what you say”. In NBC’s case, making an offer and then rescinding it has created confusion and uncertainty. Not only will this impact the financial performance of both shows (think of the advertisers and sponsors – or in your business, your various stakeholders), it also sends a morale breaking message to all your other up-and-coming leaders/stars. And when this happens, the talent that you have been nurturing for years looks not at your promises (which now seem empty) but at the rival offers which seem so unambiguous and full of opportunity. Finally, remember that we are living much more public lives than ever before. You don’t need to be Conan O’Brien to publish your personal thoughts on your career. You don’t need to be NBC to create a news network. Facebook, blogs and even Twitter operate like 24 hour broadcast channels. So whenever you think “succession planning” also think “crisis management”. You may not need to activate your crisis plan – but you’ll be glad you have one if you need it. 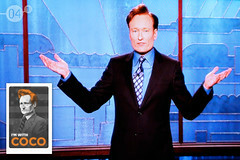 Nina Nets It Out: The Conan vs Leno debacle has yielded some valuable lessons for leaders. As always, communication and clarity are imperative.